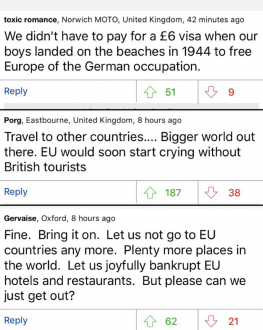 The Daily Mail is incandescent at the prospect of British holidaymakers having to pay a £6 visa to go to Europe after we leave, er, Europe. Here’s 9 more of our favourite responses. “UK tabloids furious at natural consequences of vote result they wanted” is a literary genre that needs a name. The comment section is a pure gammon fest. 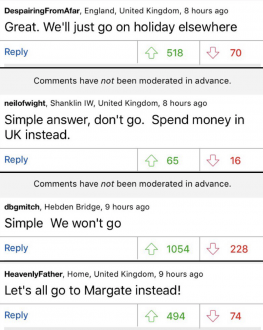 My personal favourite is the Brexit fuckwit who says he’ll be ok – he’s going to go to Spain instead! Newsflash to UK tabloids – Brits already pay a £10 visa fee when they visit the US. You're the ones who wanted the UK to have the same relationship with the EU as it has with the US. 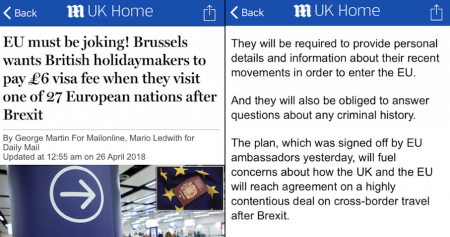 What did they expect, to be able to wave their blue passports & be ushered into a priority line at customs?